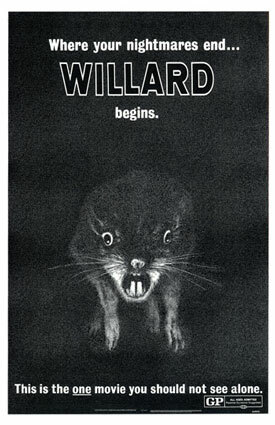 Few animals can match the symbolic terror inspired by rats like WIllard. Rats have enormous symbolic power: rats have long appeared in popular culture as loathsome symbols of the power of nature, impoverishment, and disease. The rat has won our grudging respect for its enormous skill to survive in a vast range of conditions, oddly linked to humans by our shared evolutionary successes. Rats have gone wherever humans have gone, living and invading alongside us, occasionally surfacing from alley and basement margins to remind us of our waste, inequality, and deadliness as they nocturnally feast on our garbage. 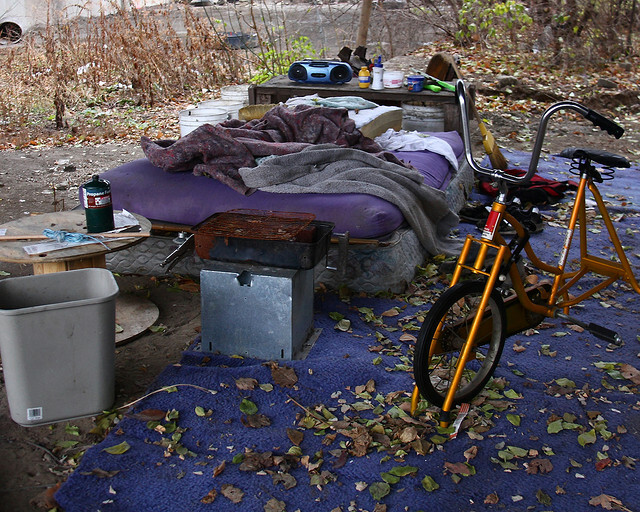 A homeless camp in Providence, Rhode Island (image courtesy lahcar1477). The Star’s shallow sympathy for homeless people mirrors a broader social picture of the homeless as predators. Rats and the homeless are painted in symbiotic relationships, becoming nearly interchangeable symbols. In 2011, for instance, Honolulu’s mayor likened the homeless to a “rat invasion,” arguing that the rejection of legal prohibitions on homelessness “`was a complete disaster because now people are out there suffering from their mental problems without us having the ability to coerce them into either the treatment that they need or into a zone that isn’t in conflict with everybody else’s rights.’” Massive displacements of homeless camps are routinely legitimized by reference to the presence of rats (in a similar fashion, Occupy protestors and their camps have been cast as predators by focusing on the rats in their midst). A homeless camp in Cincinnati (image courtesy a.r.briggs). Rats make easy emotional vehicles to caricature homeless people, but a handful of archaeologists have been conducting systematic material and social analysis of homelessness that pushes beyond facile stereotypes. The Indianapolis camps the Star lamented have been studied in a project directed by my colleague Larry Zimmerman, who has presented this work with Jessica Welch and Courtney Singleton at the World Archaeology Congress conference and published the research in World Archaeology, Archaeology, and Historical Archaeology. They and a Cultural Heritage class produced a facebook site and book on one of the most prominent Indianapolis homeless communities. The Indianapolis project suggests a series of modest everyday interventions in homeless services—providing can openers and socks, for instance, and understanding the everyday physical pathways of homeless people—that expand on simply warehousing homeless people into an undifferentiated shelter industry. Rachael Kiddey and John Schofield have conducted a similar project in Bristol that they have extended to York as well. These and a series of similar projects (e.g., Jason De Leon’s archaeology of illegal immigration) approach archaeology as an applied scholarship focused on social justice that uses material analysis to inform contemporary politics. Homeless communities inevitably require a complex range of services, but superficial stereotypes like the Star’s lament over rats simply prevent effective strategies to address the needs of people living on the streets. Homelessness and rats both provoke significant anxiety: the former reveals the liabilities of inequality and how society cares for its own, while the latter flourishes in the midst of that very inequality. Archaeology provides no resolution to the deep-seated structural conditions that have fanned homelessness, but it provides a model for systematic and reflective analysis of material conditions that avoids shallow characterizations of complex realities. 2012 Professional Lives, Personal Struggles: Ethics and Advocacy in Research on Homelessness. Littlefield, Lanham, Maryland. 2008 Adomizen: A Foucaultian Archaeology of Homelessness in Washington, D.C.’;s Monumental Core. Master of Arts Thesis, Georgetown University. 2011 Urban Heritage? : Archaeology and Homelessness in Indianapolis. Bookemon. 2010 Digging for (Invisible) People. British Archaeology 113. 2011 Embrace the Margins: Adventures in Archaeology and Homelessness. Public Archaeology 10(1):4–22. 2004 Inequality, Poverty, and Neo-Liberal Governance: Activist Ethnography in the Homeless Sheltering Industry. University of Toronto Press, Toronto. The internet is littered with distinctive if not outright odd collectibles: a brief survey of web collections uncovers assemblages of bars of soap, moist towelettes, toasters, air sickness bags, and belly button lint. Even such unusual collections have two fundamental dimensions: first, they are driven by pedagogical goals—their universe of things teaches or illustrates something–, and, second, they reconfigure, critique, imagine, and impose some idealized order on the world. Some collectors can reflectively articulate how their things reflect their experiences and visions of the social world, and others are perhaps somewhat more caught up in the magnetism of their things or their hunt; nevertheless, most collections are fundamentally distorted mirrors of how the world should be, the anxieties life provokes, and the consequential dimensions of our lives. Marching into the universe of collectors is now an army of Russians snapping up the fragments of the meteorite that fell near Chebarkul and Chelyabinsk on February 15th. Some of these “collectors” (and their international counterparts) are simply driven by the perception of potential profit to be made hawking meteorite fragments, and that is often intensified by their own financial desperation. Collectors of space debris prize such intergalactic detritus, and there is apparently some genuine market value to these things: a 23cm fragment of the Seymchan meteorite recovered in Siberia in 1967 sold in New York for $43,750 in October, and a piece of a meteorite that “pulverized” a New York cow in 1972–the world’s only known meteorite fatality–sold for $1375. It is now infeasible to distinguish between meteorites as things with exchange value and objects whose meaning resides outside market values. Nevertheless, the attraction of a collected meteorite, Doctor Who toy, or movie poster (and every other material collectible) have distinctive symbolisms that are not reducible to exchange values. Meteorites invoke the power of nature’s unpredictability, which is mirrored in the wave of media coverage last week contemplating how humans can control such random interstellar debris collisions. Waves of people are now preparing for various impending apocalypses, so one asteroid mining company has found a receptive audience for its warning that “many asteroids pass by Earth with little or no warning. We were not exaggerating. … While not every approaching asteroid may be detected, and with little warning not all can be prevented, in this case a little warning would have prevented many injuries, and quelled the panic that followed” (underline in original). Absurd conspiracy theories about the Russian meteorite as American weapons testing, Biblical apocalypse, and alien invasion are ultimately efforts to explain seemingly inexplicable events. In 1794, Italian abbot and geologist Ambrogio Soldani wrote one of the first scientific studies of meteorites when he published On a Shower of Stones that fell on the 16th of June at Siena. Soldani’s analysis documented a June, 1794 meteorite shower on Siena, Italy and assessed some of the fragments that had formed in the “high clouds.” This moved the explanations of such phenomena toward their cosmic origins, a point argued most influentially by Ernst Chladni, whose 1794 study On the Origin of the Pallas Iron and Others Similar to it, and on Some Associated Natural Phenomena argued for the spatial origins of meteorites. The “Pallas Iron” (usually known as the Krasnojarsk meteorite) was a 1500 pound Russian meteorite collected in 1772 by Peter Simon Pallas. Perhaps the most famous American meteorite is the Willamette meteorite, a 32,000 pound meteorite that was first documented by Europeans in the early 20th century. 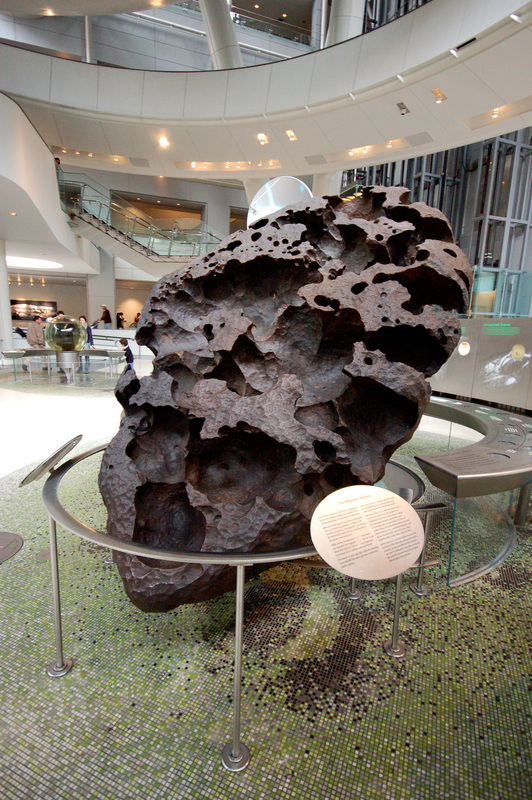 The legal ownership of the meteorite was turned over to the Oregon Iron and Steel Company in 1905 and purchased by a collector who subsequently turned it over to the American Museum of Natural History in 1906. Known to native peoples as Tomowanos, the meteorite became the target of a Native American Graves Protection and Repatriation Act (NAGPRA) claim to return the meteorite to Oregon native peoples. In 2000, the Museum signed an agreement with the Confederated Tribes of the Grand Ronde Community of Oregon ensuring permanent access to the meteorite by tribal members, which includes annual ceremonies conducted in the museum documented in the community’s facebook page. The fascination with such debris likely has always revolved around its material evocation of the primal elements of the universe and mysterious if not inexplicable dimensions of nature and the cosmos. Possessing such an object—and explaining it—secures some meaning of power over an otherwise fickle and uncontrollable nature. 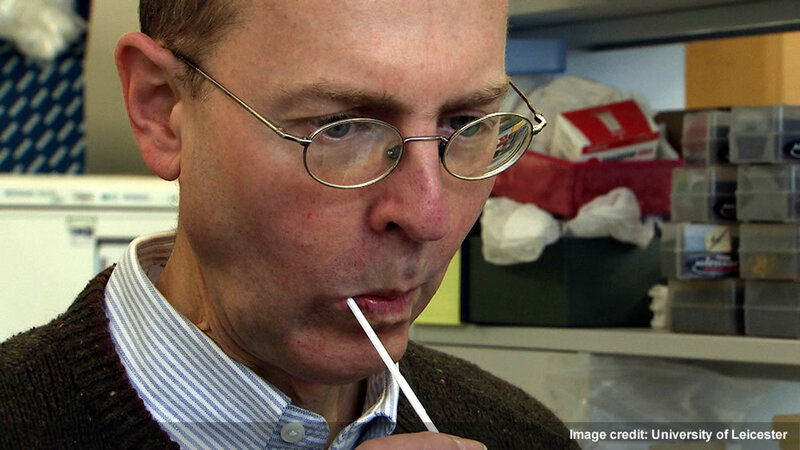 The explanations may be purely scientific dissections of the chemical origins of meteorites and spatial debris, which provides some measure of explicability over otherwise unpredictable meteorites. Yet even then meteorites sound oblique but unsettling warnings about the power of nature: after all, the Chicxulub Crater in the Yucatan peninsula was formed by an asteroid collision that inflicted mass extinctions roughly 66 million years ago. The fascination with such objects certainly is fanned by their exchange, by it was not created by the market: in the case of space debris collections, the curiosity over the thing and its invocation of nature’s power preceded a marketplace dealing in such things simply as interchangeable commodities. When fragments of the Willamette meteorite have been offered for sale at auction, indigenous people have been at odds with sellers, including one quoted in 2007 as indicating that “The beliefs of the Grand Ronde [Oregon indigenous peoples] should not preclude science or the commerce of meteorites” (the fragment eventually fell short of its pre-sale estimate and was not purchased). The collection of such objects that materialize efforts to secure symbolic control over life is somewhat akin to Gabriel Moshenska’s study of World War II collections of shrapnel. During World War II, children collected, traded, and in somes cases curated shrapnel to “cope with the upheaval and brutality of total war.” Moshenska argues that shrapnel collecting was distinct from other material collecting in its effort to negate and domesticate wartime violence if not assume an active if symbolic role in the war. Like meteorites, every piece of shrapnel was uniquely twisted into its contemporary form reflecting its own peculiar origins. Shrapnel was free for collecting with no long-term ambitions to trade the fragments for anything other than different shrapnel, so it escaped the impression of marketplace values (although shrapnel is now traded on ebay and in collector communities). 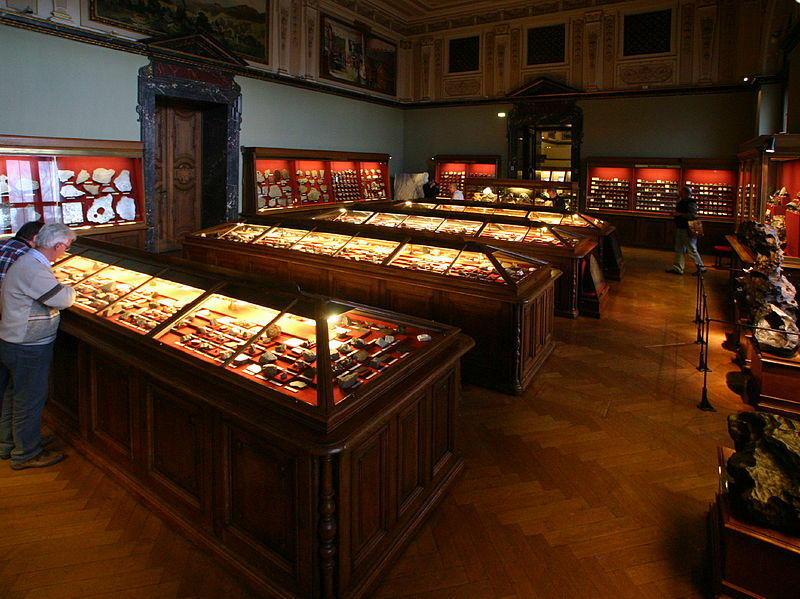 All collecting involves some aspiration for control in the way assemblages are used to categorize the world and social life, and objects associated with violence in the case of shrapnel or nature’s unpredictable fury in the case of meteorites certainly aspire to establish some control over the things we cannot control. Any rock bears the symbolism of deep geological time, and many people collect geological specimens that weave this story of time and geological complexity. Yet meteorites invoke that primal depth of time and nature while underscoring its unpredictability and reflecting that some people are wary of scientific explanations. For many such observers, meteorite fragments are less about exchange value than their symbolic illumination of the depths of nature and humans’ absence of control over nature. 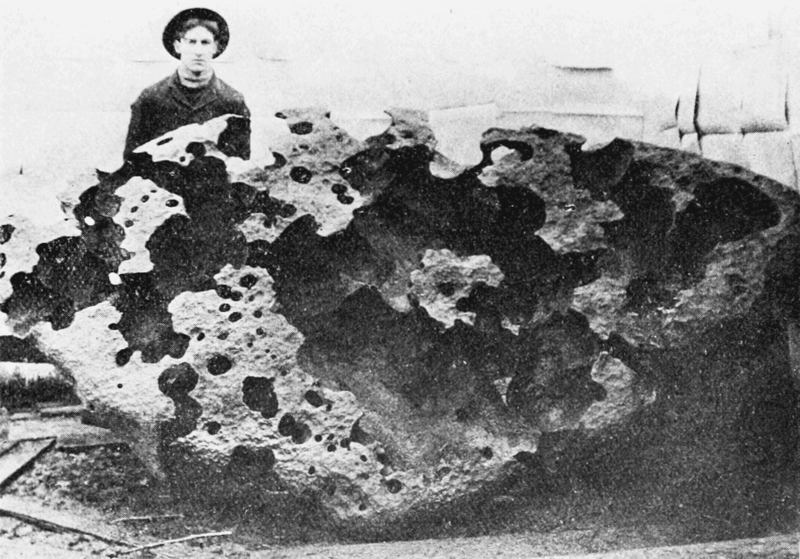 1901 A Century of the Study of Meteorites. Popular Science Monthly 58:429-433. 1913 Meteorite Collecting and Collections. Proceedings of the American Association of Museums VII:11-15. 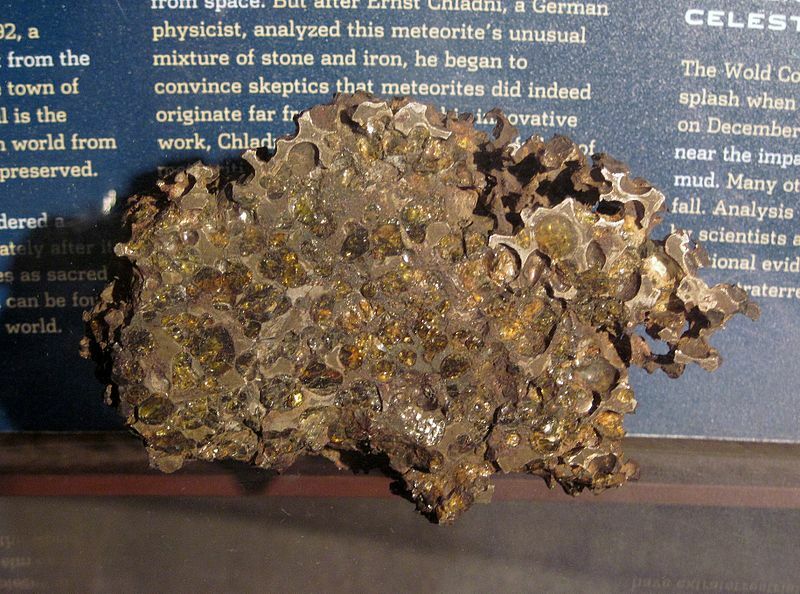 1995 Siena, 1794: History’s Most Consequential Meteorite Fall. Meteoritics 30(5)540-541. 1996 Ernst Florens Friedrich Chladni (1756-1827) and the origins of modern meteorite research. Meteoritics and Planetary Science 31(5):545-588. 2002 Domenico Troili (1766): “The true cause of the fall of a stone in Albereto is a subterranean explosion that hurled the stone skyward.” Meteoritics and Planetary Science 37(12):1857-1864. 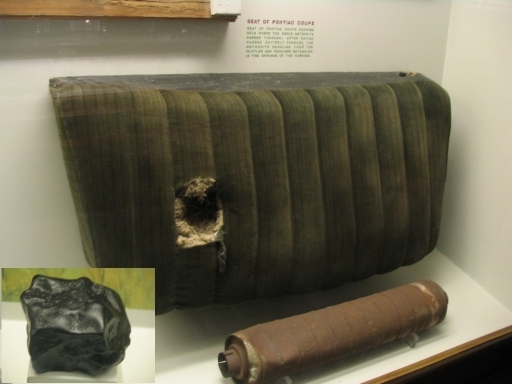 2006 The History of Meteoritics—Overview. In The History of Meteoritics and Key Meteoritic Collections: Fireballs, Falls, and Finds, edited by G.J.H. McCall, A.J. Bowden, and R.J. Howarth, pp.1-13. London Geological Society, London. 2008 A Hard Rain: Children’s Shrapnel Collections in the Second World War. Journal of Material Culture 13(1):107-125. 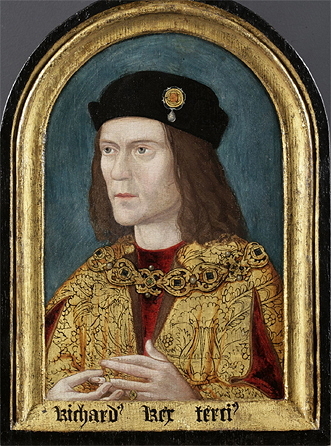 The earliest surviving portrait of Richard III shows him in about 1520. 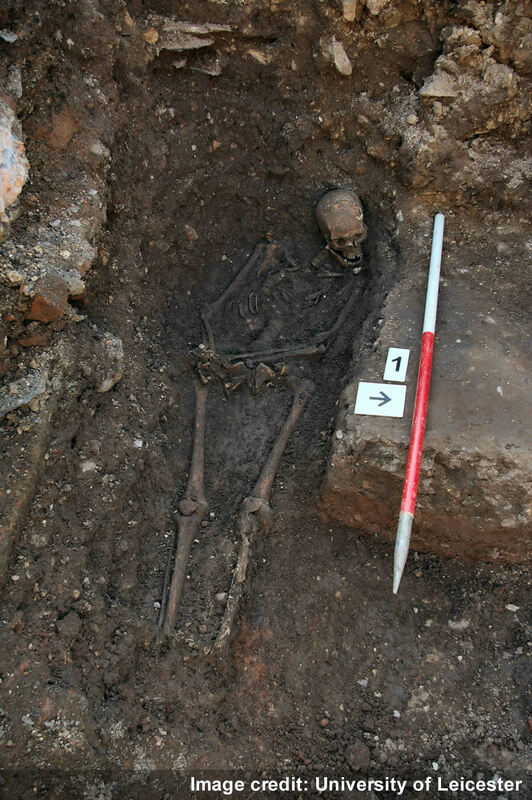 This week no archaeological story has received more press than the confirmation that a skeleton excavated in Leicester in September 2012 is indeed the mortal remains of Richard III, the last Plantangenet King of England. Archaeology often is aesthetically compelling and provides a fascinating narrative, and in this case a thorough and compelling scientific study and the tale of a king slain in battle, ending his line in the ignominy of an anonymous hastily dug grave, is especially captivating. The presentation of that data on Monday—and some observers’ qualms about how such scholarship is presented in public space—actually sound some interesting questions about the public presentation of archaeology. 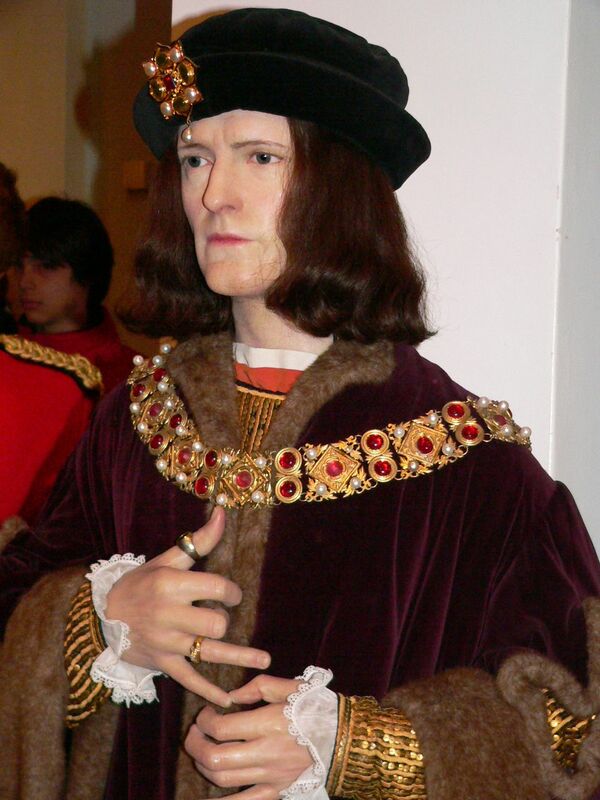 Richard III’s two year reign ended in 1485 at the Battle of Bosworth Field, which ended the War of the Roses and ushered in the Tudor dynasty. Richard’s corpse reportedly was stripped, thrown across horseback, and taken to nearby Leicester, where it was on view in the church of the Greyfriars and subsequently buried. The church itself was razed during the 1530’s dissolution of the monasteries, and for over four centuries Richard’s mortal remains were lost. In September 2012 the University of Leicester Archaeological Services conducted an excavation in a parking lot at the likely Greyfriars site. 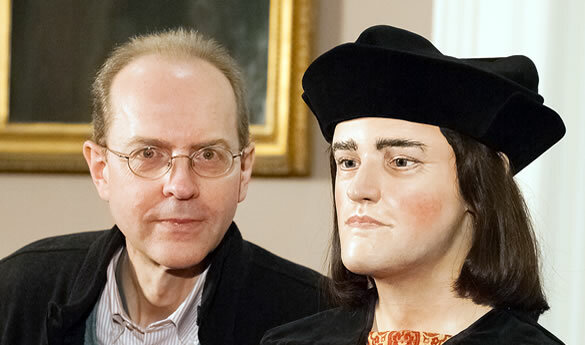 The Leicester archaeologists were sober about the likelihood they would recover Richard III, but they recognized the site would certainly provide medieval and post-medieval material, and they conducted a radar survey and the subsequent excavations. Against all odds a skeleton was identified on the first day of excavations. 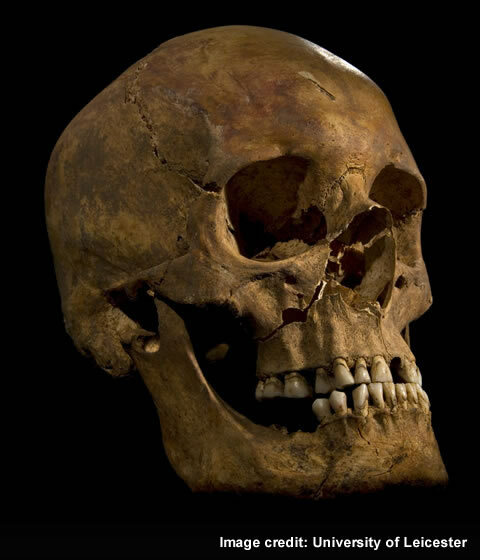 The remains had severe wounds and a pronounced skeletal curvature suggesting the body could be that of Richard III, and carbon dating, osteological analysis, and DNA testing with Richard’s living descendants demonstrated beyond reasonable doubt that the body was indeed that of Richard III. The University of Leicester was justifiably proud of their ULAS excavation team, and on February 4th they had an elaborate public program at which the Leicester scholars presented the results of their analyses. The unveiling of the rich archaeological data and the fascinating detective tale conducted by the Leicester archaeological team was good theater, and I was among the archaeology geeks who woke up before daybreak to watch the news being streamed and monitor twitter as the analysis was shared publicly for the first time. What these comments reveal has nothing to do with the scholarly impact of the Leicester project. These relatively isolated voices refuse to accept that some essential dimension of good scholarship can in fact be informed by popular curiosity. As Morley and Higgins retreat back to the ivory tower, most academics like the scholars in the ULAS are actively part of their communities and doing rigorous scholarship that weighs popular curiosity and does not have the audacity to suggest that there are some timeless scholarly questions impervious to the sands of time or the sentiments of society. 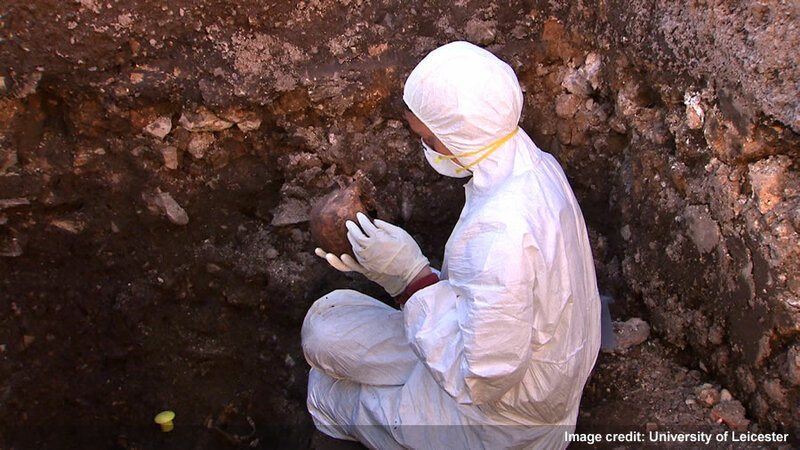 The University of Leicester page detailing the excavations is indeed a clever and thorough presentation that recognizes the popularity of archaeology as well as this particular historical narrative, and their telling is good science and good story-telling. The Richard III skeleton in situ (image University of Leicester). The increasingly common presentation of archaeology in popular media and as a media-friendly face for the academy inevitably casts archaeology in stereotypical ways. Can television shows or thorough press conference like the ULAS session actually capture a complex archaeological analysis? Maybe the more challenging question is instead can archaeology make the complexities of past experiences and materiality interesting in a more satisfying way than popular culture? I believe in scholarly rigor and understand that complex historical and academic narratives cannot be easily reduced to palatable popular representations, but every archaeological and historical narrative is inevitably itself “incomplete” or might be interpreted in fresh ways by other scholars. I am not very sympathetic to the judgmental voices that believe archaeology in particular and academic knowledge in general must take a highly specific form, and it at best suggests a lack of creativity to be unable to fathom that interesting and academically relevant research questions can be asked of essentially any material data. Theoretically we are all receptive to the idea that we should raise imaginative children who explore the world and creatively daydream about who they are and can become. We all realize that such daydreaming and imagination are what happen as children play, so adults typically try to find toys that provide rich possibilities for play. There are myriad reasons particular toys are favored by many kids—the overwhelmingly weight of marketing, the sway of popular culture, and the impression of other kids all matter–, but the most popular toys provide a breadth of play possibilities, revolve around compelling symbolism, and accommodate the unpredictable creativity of children. A 1959 Barbie doll (courtesy wikipedia). The practical challenge with toys is that most parents are not especially enthusiastic to encourage their own children to push the envelope on moral codes, dominant ideologies, and proscribed gender, social, and political roles. Yet children use toys to literally play with their own sense of selfhood, crafting and testing their class, sexuality, ethnicity, gender, materiality, and every other possible dimension of self as they become social animals sharing the creative dimensions of play. Anybody with the ethnographic experience of parenting realizes that kids know that all rules are made up and imposed by adults; those dominant rules may cast the world in terms a kid finds disinteresting (or even disempowering), so play often repudiates imposed rules. Yet for plenty of parents and moral ideologues, manufacturers and thoughtful adults need to monitor and perhaps control the “play possibilities” provided by various toys so that playing with those toys will produce particular types of desirable adults. Barbie presents an especially rich range of play possibilities: Barbie is a bodily form that materializes gender and sexuality, dimensions of selfhood that even the youngest children recognize, but that creative window provokes widespread adult anxiety. Many apprehensive adults caution that Barbie does not provide a “realistic” role model, which may refer to her embrace of consumption, her relationships with men, or her physical form. That complaint is worth taking seriously, but it risks misunderstanding the richness of play, which is not necessarily goal-directed and often actively avoids “reality”; and it hazards misunderstanding the breadth of factors alongside toys that shape how we view gender, sexuality, and any other dimensions of selfhood. A truly “realistic” toy, much like a television show true to the pace of everyday life, would simply be boring, but toys that hyperbolize some recognizable dimensions of the real world—like Barbie’s bodily form—provide more interesting frameworks for play. Ukranian model Valeria Lukyanova: the Barbie ideal assumes human form. This may be nothing more than one person’s odd appeal for media attention to support her career lecturing on New Age spirituality, but Lukyanova is not alone adopting the guise of a doll. Forbes ridiculed the spate of Ukranian women modeling themselves on the beauty ideals of dolls, calling it a “Barbie doll syndrome” in which women reveal or perhaps try to attain “impossible standards of beauty.” The Kyiv Post reported on Lukyanova and friend Olga Oleynik as well as Anastasiya Shpagina, who wears dense anime-style makeup, and there are enough of these “human dolls” that EXpose Barbie takes illuminating these people as its central mission. The apparent wave of Ukranian women imitating doll aesthetics follows in a line of women who have sculpted their bodies with the same goal, and Cindy Jackson is perhaps the best-known of those figures. Jackson’s book Living Doll details Jackson’s quest to fashion herself in the image of Barbie, because “Through Barbie I could glimpse an alternative destiny.” Sarah Burge likewise has physically modeled herself on Barbie with the intervention of over 100 surgical procedures, and when “she married husband Tony three years ago, she dressed as a Barbie.” For many horrified observers, this is not self-empowerment—which is certainly how Jackson and Burge present their extensive surgeries–but instead a dismaying alienation to one’s own body. Perhaps even more unsettling is a surgical “vaginal rejuvenation” procedure referred to as “the Barbie” in some quarters that is a radical labiaplasty removing the entire labia minor. While the dismay over plastic surgery focuses on women’s cosmetic surgery, American Justin Jedlica has spent over $100,000 fashioning himself into a likeness of Ken. It is difficult to fathom precisely how a toy like Barbie shapes any given child’s vision of themselves, but certainly Barbie has had a profound influence on how we see beauty and gender. The sort of uncertainties about beauty and sexuality that challenge many adolescents probably do not fuel the overdone cosmetic surgery careers of caricatures like Valeria Lukyanova, but clearly some people have significantly unsettling anxieties about their bodies and selves that can be fanned by Barbie symbolism. Nevertheless, Barbie sometimes looms as an easy target that is sloppily used to refer to a broad range of ideologies embedded in the discourses that socialize children. In November, 2000, for instance, Time’s Amy Dickinson took aim on Barbie when she noted that “Women my age know whom to blame for our own self-loathing, eating disorders and distorted body image: Barbie.” The reality, of course, is more complicated and reaches into the heart of a patriarchal society whose ideological values are reproduced by Barbie and a universe of discourses and material things. 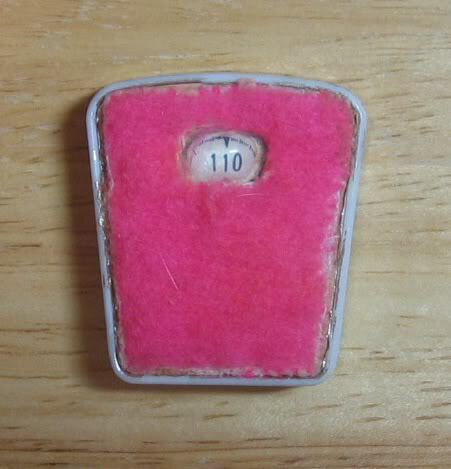 The 1965 Barbie bathroom scale is permanently set to 110 pounds (courtesy wikipedia). It is notoriously difficult to assess how much any single toy shapes how adults later view themselves, so studies of Barbie cannot provide much clarity without simultaneously examining a whole range of other elements. In 2004, for instance, Tara L. Kuther and Erin McDonald conducted a study of Barbie based on interviews with sixth-grade through eight-grade boys and girls and concluded that most girls consider Barbie’s body “unrealistic”: “The girls viewed Barbie as the image of perfection, and perhaps too perfect, yet she defines physical beauty.” Yet what might actually constitute “realism” or “perfection” is unclear, and what may be most interesting is that children believe some sort of idealized authenticity can be secured. Kuther and McDonald expressed genuine surprise at the number of children who related stories of what they referred to as “torture-related play,” which included cutting the dolls’ hair, painting them, or removing limbs. Casting this as “torture” risks sounding unintentionally judgmental, and such creative modification of toys in general and Barbies in particular is likely familiar to any parent. Anybody who has surveyed boxes of Barbies being sold at flea markets will realize that secondhand Barbies exhibit a wide range of creative hair styles, magic marker tattoos, and horrific injuries received in Barbie camper fires. Kuther and McDonald suggest that such “torture-related play may reflect girls’ ambivalence about their female status and the societal notions of femininity and beauty,” but all societal norms inspire some ambivalence, so the deeper question is specifically what about gender and sexual norms inspires apprehension among the children playing with Barbies and how does Barbie fan (or quell) such apprehensions. In a 2000 study in Review of Education, Pedagogy, and Cultural Studies, Jacqueline Reid‐Walsh and Claudia Mitchell argue that children play with Barbie in a vast range of non-sanctioned ways, an argument also made by Erica Rand’s Barbie’s Queer Accessories. Reid-Walsh and Mitchell do not dispute that children may receive problematic messages from Barbie discourses, but they also argue that for many children playing with the doll was a positive experience. Rather than polarize Barbie’s meaning in play, they advocate for a position that acknowledges the ideological incorporation performed by the doll while acknowledging the ways the doll provides an empowering imagination of women’s ambitions. In her founding moments, Barbie was certainly politically forward-thinking in some critical and empowering ways for at least one generation of children. For instance, Barbie initially did no housework, a reflection of founder Ruth Handler’s ambition to have Barbie model lofty ambitions for a young, professional working woman. Through 1963 39 additional outfits and over 36 fashion Paks were introduced for Barbie, and with the exception of the 1963 “Barbie Baby-Sits” outfit Barbie did not do any conventional domestic labor. In 1965, though, several new outfits including “Barbie Learns to Cook” were introduced. In 1970 a girl raised a sign at the Women’s Strike for Equality reading “I am Not a Barbie Doll,” reflecting underlying tensions with the play options and gender constructions Mattel was providing. Barbie remains effective in the face of such protests because she ambitiously invokes some traditional and comfortably familiar notion of gender roles even as she embraces the ambitions of women. Yet Barbie was at least in her earliest years posing a genuine alternative for many women, and even in her more conservative moments some children have turned the doll to progressive ends. “Real” beauty or womanhood is at best an ideological ambiguity, and toys are perhaps less about clear role model testing as they are about the creativity of assessing societal norms. Productive play seems to include some creative rejections of certain social mores, and in fact many adults chafe against many of those same codes and recognize those against which we cannot push. The invocation of an ideal descended from a plastic toy is ludicrous, and in the hands of even a creative child the “Barbie ideal” is slightly unsettling: understandably, we worry that some children cannot critically assess such public shows of gender and sexuality. Barbie is by no means a “blank slate” onto which a child can imagine anything, but the individual reception of Barbie meanings and broader toy symbolism is rooted profoundly in how parents and adults acknowledge the fluidity of gendered norms and resist a universe of disempowering gender symbolism. 1995 Barbie, my liberator. In Re‐visioning feminism around the world. 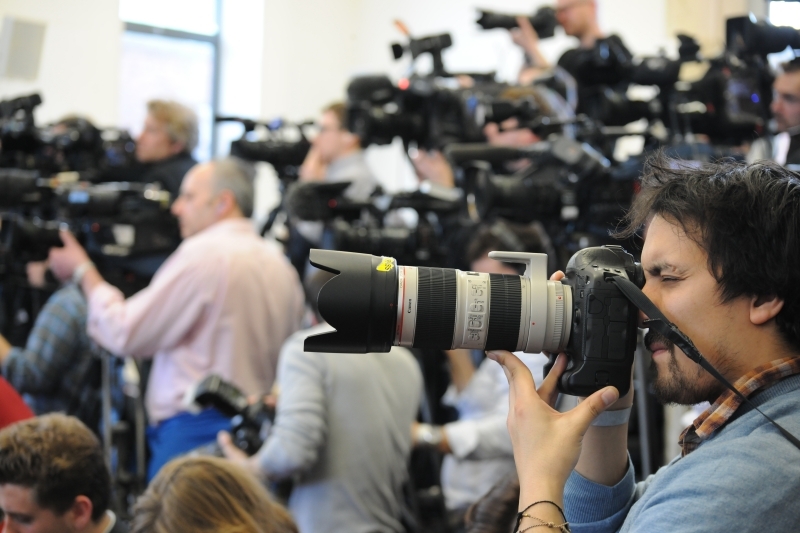 Feminist Press, New York. 2004. Early adolescents’ experiences with, and views of, Barbie. Adolescence 39(153):39-51. Subscription access. 1994 Forever Barbie: The Unauthorized Biography of a Real Doll. William Morrow, New York. 1999 Domesticating Barbie: An Archaeology of Barbie Material Culture and Domestic Ideology. International Journal of Historical Archaeology 3(4):225-259. 1999 Barbie’s Queer Accessories. Duke University Press, Durham, North Carolina. 2000 “Just a Doll”? : “Liberating” Accounts of Barbie‐Play. Review of Education, Pedagogy, and Cultural Studies 22(2):175-190. Subscription access.